Have you been called a hipster? Or dished out the term with a snicker? Of course you have, yet finding someone that identifies as a hipster is impossible. This is unique for a societal label. We can get some idea of what a hipster is with an 800 word urban definition or Wikipedia with 29 references. The definitions will vary, but it’s the first term in history that was created by American consumerism and marketing. Other labels and stereotypes verify their, at least partial, legitimacy. Hippies admit they are, or were hippies. Metalheads and punks like to be defined by the music they love. Even jocks, nerds and stoners stand on united fronts that deflect attempted insults. This is overblown by mass media, but the reality is that everyone needs a group, unless you’re a righteous dude. The hipster has the most historical significance of any label. The seeds of American counterculture were planted in the 1940s. The combination of anti-war movements, post-prohibition values and drug use created an evolving culture of anti-establishment. At the heart, the “beat generation” was jazz music. Bebop jazz—meant for listening and not for dancing—was developed by Charlie Parker and others during the time period. This music was played by black musicians and accepted by white people who were known as “hep” and hipsters. This hipster class, who referred to themselves as hepcats, was known for smoking weed, listening to jazz and mingling late into the night. As social media began to infiltrate our lives, the term hipster began to enter dialogue once again. The broad and changing description seems to be a bizarre combination of: skinny jeans, flannels, thick glasses, coffee shops, Pabst beer, Macbooks, funny hats, vintage everything, vinyl records, cigarettes and non-mainstream music. How do we know? We’ve seen it in editorials, commercials, TV shows and sports. This laundry list of associations causes hipsters to be accused of being trendy and anti-corporate for the wrong reasons. Their perceived hate of everything popular and knowledge of that band “you’ve never heard of” was all created with imagination. The struggle of the hipster is non-existent. Our natural inclination to separate into cliques means defining other cliques comes with the territory. In the case of the hipster, their definition is flawed because the contemporary use of the term has no meaning. It’s just a series of marketed products and similar looking groups of friends. The hipster is associated with a privileged consumer, so going against mainstream doesn’t make sense. This is another paradox of the hipster. Marketing departments are infatuated with targeting specific demographics with ideal products. 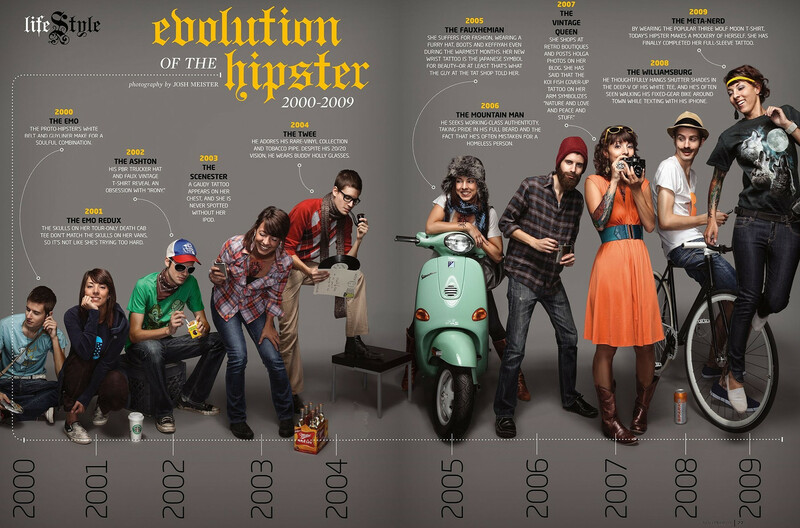 The hipster term reemerged as companies supplied targeted audiences with products. For example, The Hunch.com report that compared Mac and PC users showed Mac users were more likely to be “liberal’ and trended toward independent films among other stats. This information can be used by Apple to target frequent computer users in liberal areas, who end up being the coffee shop hipsters. In the 1940s, you were considered ‘in the know’ and the fabric of an important American subculture. The negative connotation now means identifying yourself as a hipster basically admits to being a mindless consumer. What other terms are set for a comeback through marketing and consumerism? Yankee, Greaser…Floozy? The next time you spot a pack of hipsters in the concrete jungle, remember that concept is only in your head because of well-paid marketing teams. Thanks for reading Cris, and I agree that it’s a little short! I just started doing research on this kind of stuff and wanted to get something out there to see if people were interested. It’s always a tough balance as far as not boring people with long articles yet providing enough information to really be insightful. There will be longer posts in the future so stay tuned!